Hundreds of people gathered at the Arvest Bank Theatre at the Midland to commemorate the Susan G. Komen Greater Kansas City’s inaugural Rock the Ribbon concert. This special event celebrated the strength and survivorship of Kansas City’s breast cancer survivors. 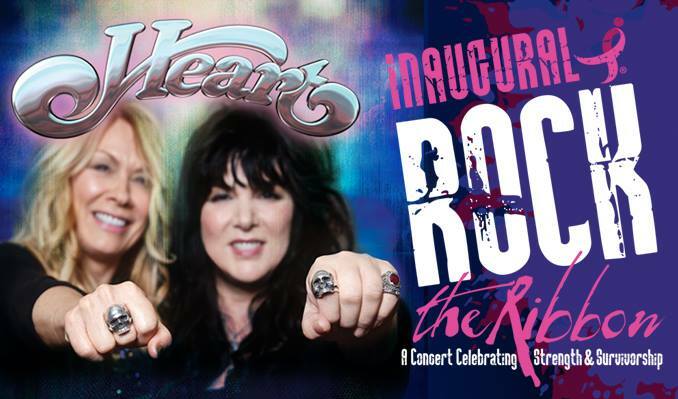 Headlining the concert was four-time Grammy nominated rock group Heart. For 42 years, the Seattle-based band sold over 35 million records worldwide and received numerous accolades including having albums drop onto the Billboard charts in four different decades (1970s, 1980s, 1990s and 2010s). The group reached numerous milestones this decade as Ann and Nancy Wilson paid homage to Led Zeppelin at the Kennedy Center Honors (2012) and was inducted into the Rock and Roll Hall of Fame on April 18, 2013. The current line-up of Heart: sisters Ann and Nancy Wilson, drummer Ben Smith, bass guitarist Dan Rothchild, guitarist Craig Bartock and keyboardist Chris Joyner successfully entertained the audience with a rousing set that perfectly showcased the group’s diverse genres they mastered over their long journey in the recording industry. In addition to several Heart staples, the group also paid homage to the Godfather of Soul (“Get Up Offa That Thing”), Led Zeppelin and longtime friend, the late Stone Temple Pilots founder Scott Weiland, who passed away in his sleep this past Thursday.